I love running books, films, and movies. When I see a new one coming out I get excited, and my response was no different when I first read about the MY RUN movie a few months ago. MY RUN, The Terry Hitchcock Story, is about more than just running, it is about running the marathon of life and all the obstacles that were thrown Terry's way. Some have called him the real life Forrest Gump, but I am making an assumption here that given his journey and why he went through it, he would rather just be called a loving father and husband. We’re all running a marathon one way or another in life. Whether it is staying afloat as a single working parent, battling a disease or trying to conquer life's obstacles, it all involves a fight. Join us for an unforgettable inspirational story about 57-year-old Terry Hitchcock who ran 75 consecutive marathons in 75 consecutive days. 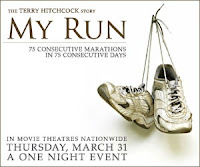 The 10 time award-winning and critically acclaimed documentary MY RUN narrated by Academy Award winner Billy Bob Thornton is coming to 500 movie theaters nationwide for an exclusive one night premiere event on Thursday, March 31st at 7:00pm (Local Time). Immediately following the film on screen, audiences will take a deeper look into the story through a 15 minute interview with star Terry Hitchcock and his son, support team member Chris Hitchcock. Are you planning on seeing this upcoming movie? If you are not yet decided you need to go over and read a bit more at www.myrunmovie.com and check out the MY RUN Facebook Fanpage. If you have already decided like me you need to head over and tell them you are coming and invite your friends. What a cool way to spend the evening with some of your running friends! While you are here make sure you Follow 26.2 Quest and Like the 26.2 Quest Fanpage, and don't forget to follow @262quest on Twitter. You never know what you may find if you start to follow.